We’ve been reminiscing a lot on this trip about our early visits to the cities we’ve come to. It was almost fifteen years ago that we first landed in Darwin, and the city’s grown tremendously since then. We were also here at Christmas, and the heat and humidity were staggering. That was the trip when the photographs of Kakadu all came out with a lavender cast to them when we developed them. And we learned that if your watch isn’t waterproof, you can sweat it to death. Truth. Darwin’s been lovely this time, cool and breezy, and we’ve enjoyed walking the Esplanade and trying to piece together our memories of that first trip. The Old Town Hall looked familiar, and the overlook at the Wharf, but we couldn’t quite make the mental map click. As soon as he said that, the geography of the CBD snapped back into place, and I knew where everything was, got my bearings back, and remembered that trip from fifteen years ago with a clarity that brought delight with it. All was right in downtown Darwin again, the sense of being at home suddenly returned. I had a similar moment of stars aligning, or the cosmic grid snapping into place later in the afternoon as we were preparing to leave the premises of Outstation Art, a new gallery that’s opened in recent months in Parap Place. Building on the success of Raft Artspace, and the presence for some years of 24Hr Art, Outstation, Nomad Art, and the Tiwi Art Network have combined to build an Indigenous art gallery neighborhood that promises a bright future for Darwin. We spent about an hour in conversation with one of Outstation’s two partners, Matt Ward, who formerly worked for Maningrida here in town. 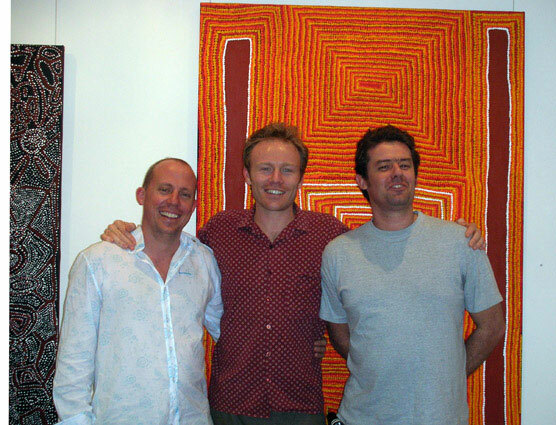 The other partner is Ben Danks, a former field officer with Papunya Tula Artists. Together they have decided to present the works of emerging artists from a broad cross-section of art centres in the Territory and in WA, cutting across the Desert, the Kimberley, and Arnhem Land. There’s a freshness and an enthusiasm to their approach that was infectious, one that it shines through in their new show of work from Balgo. And it all snapped into place, like finding the Old Woolie’s, when I asked them to pose for this photo. This is actually the second or third attempt at a serious group portrait. That’s Matt on the left, Ben on the right. Luke Scholes (in the middle) is up here to help out his old mate from PTA during the big art week: Ben’s first son was born Sunday night. As they tried to fall into line, the teasing and joking revealed an easy affection and an unrestrained delight in what they’re engaged in here. That sort of optimism clicked: it’s great to feel it in these uncertain times. I came away from the encounter thinking that there are still new ways to build partnerships between galleries and art centres, still people out there who are willing to work hard on behalf of the artists, and who find good spirits along the way. I’m hoping that the blokes at Outstation have set the tone for me for the rest of the week. We’ve seen great art already there, and at Raft Artspace, where Rammy Ramsey and Freddie Timms do the Jirrawun mob proud. I’m looking forward to the delight of the Darwin Aboriginal Art Fair, the surprises of the NATSIAA, and the general hubbub that’s sure to ensue over the next few days. I’m ready to do it all with a smile. This entry was posted in Art, In Australia. Bookmark the permalink.